Yellow diamonds can be of many differing shades, also with over tones of other colours such as green. Yellow Diamonds are in fact at the far end of the grading spectrum, so once you go through the grades from white (D) you get more and more tint within the diamond crystal body. The starting point for grading white diamonds is “D” colour , but at the other end of the alphabetical scale you start to see colour emerge in such a way that the diamonds take on a stronger distinct yellow colour. This can also head into the more brown colours, light champagne and cognac etc. N-R = Very light Yellow. Note: only white diamonds are graded from the back. Coloured diamonds (yellow / pink etc.) 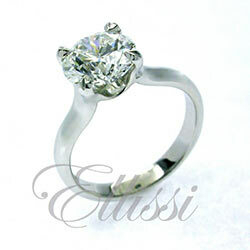 are graded from the front because the cut of a diamond plays such a massive role in colour enhancement. So depending on the outcome the cutter thinks will best suit the gem in hand and which will be most profitable, they will cut the shape accordingly. If they are trying to produce the yellowest diamond for example, they would be very unlikely to cut an emerald cut or round brilliant cut. They would instead choose a radiant or cushion cut, as these particular cuts enhance the inherent yellow tint in the diamond, when viewed from the top. Beyond Z we see the “Fancy colours” although in the X,Y and Z we do still see some nice pretty yellow diamonds. Its not a really a strong colour, but could give you a far larger diamond for the money with a nice light yellow. “Fancy” Colour Yellow Diamonds are not given A-Z grade levels, Althought there can be a little bit of a cross over between Y-Z and “Fancy light”. This depend mainly on then type of certification that the person submitting the diamond has requested, its methodology being different from a coloured diamond cert to a white diamond cert. Fancy Coloured Yellow diamond levels. The most highly prized of these would be the Intense Yellow Diamonds and the Fancy Vivid Diamond grades.These are truly very yellow,as you can see from the photo below. Photos which show a combination of E/F white diamonds, along with Fancy Intense Yellow Diamonds. Yellow Diamonds can be any type of cut that a cutter decides, however because the cut is very important in helping to bring out the colour and beauty of the diamond, many cutters elect to cut Radiant Cut yellows, with Cushion cut diamonds, these two would make up around 70 – 80 % of the larger stones. 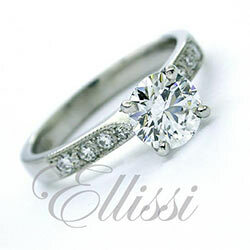 Emerald cut would be the next most common, with few cutters cutting round diamonds from the yellow rough crystal. Below are some Yellow diamonds that we have used for rings in the past, Yellow diamonds can have inclusions ( tiny imperfections ) inside just like the more common white diamonds, however the intensity of the colour is the most important feature, as a result, not quite as much importance is placed on the clarity grade, having said that it should still not be dismissed as it does still matter to the eye. Many inclusions in yellow diamonds will also take on a yellow look, just as in white diamonds many inclusions are white ( remembering that in fact a “White” diamond is clear, not white ). The yellow diamond below was a 3.15 ct round brilliant cut in a fancy light yellow, if you look carefully you will see some of the inclusions that are in this diamond, the clarity grade here is in fact SI1, and as the photo shows, a very clean example. Yellow diamond “FLY” Fancy Light yellow. 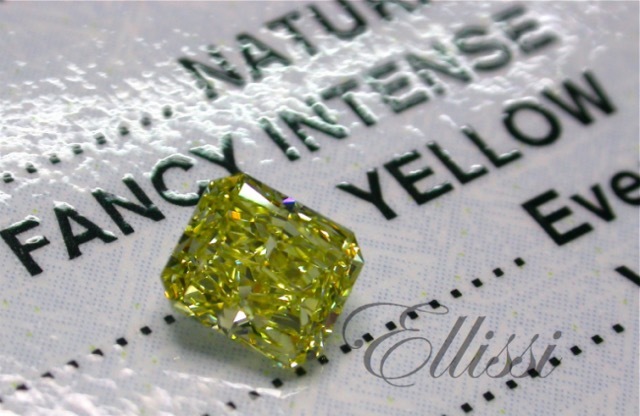 Fancy Intense Yellow, with D/E White diamonds.